As a poet and national icon, elderly Lee Jeok-yo (Park Hae-il (박해일) has enjoyed incredible success, even preparing for a museum to be constructed in his honor. Yet now is the time for his young apprentice Seo Ji-woo (Kim Moo-yeol (김무열) to shine as his new novel becomes an incredibly popular and rapid bestseller. However their lives, and their relationships, are drastically altered when a young girl named Han Eun-gyo (Kim Go-eun (김고은) visits their home, charming them both with her youthful vitality and curiosity. While A Muse takes quite some time in establishing the life of poet Jeok-yo and that of his student Ji-woo, the inception of Eun-gyo – also the name of the original Korean title – distinctly elevates the film and gives it direction and purpose. Director Jeong Ji-woo does an incredible job of constructing Eun-gyo as an intoxicating protagonist, a young woman whose youth, energy and curiosity are infectious and spellbinding. However, the most prominent form in conveying such devotion is through the fetishization of her body, featuring close-ups of her skin and various body parts, sexualizing Eun-gyo to the point of worship. With the knowledge that Park Hae-il portrays the elderly poet, such scenes are (despite the misogyny) tender and romantically sexual, yet had an actor of the correct age performed the role perversity would undoubtedly enter critical debate. Luckily Jeong Ji-woo also emphasizes the emotional and spiritual connections between the two, and that Jeok-yo desires Eun-gyo’s youth, purity and innocence as much as her physique, as she is in turn attracted to his depth of character and devotion. Age may suggest otherwise but they are kindred spirits, and sequences in which they strengthen their bond are heartwarming and endearing, particularly during the soft-focus scenes where Jeok-yo imagines himself as a young man. Their relationship is in stark contrast to those involved with Ji-woo, who worships Jeok-yo as a respected surrogate father and idolizes Eun-gyo due to their similar ages and as someone who can heal his loneliness. The director is highly intelligent in constructing each relationship as distinctly different entities, evolving each subtly and with realism as jealousy and desire intermingle with love and affection. However as Ji-woo is certainly the less developed of the three he perhaps unfairly falls into a villainous category, rather than a conflicted young man. Romance and personal connections inform the exploration of age within A Muse, which is arguably the central concern of the narrative. The depth, symbolism and subtlety are eloquently conveyed as each protagonist gradually reveals their shortcomings seemingly ascribed through age. 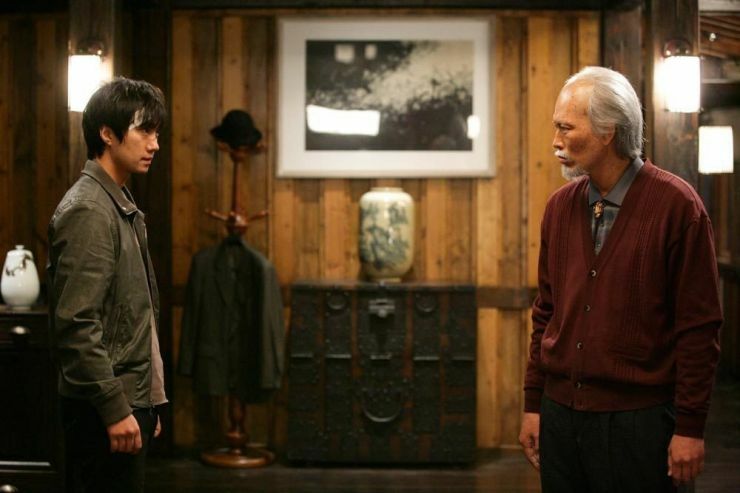 Jeok-yo, having lost his youth, uses Ji-woo and Eun-gyo as agencies through which to live again, contrasted with Ji-woo’s competitive masculine nature and Eun-gyo’s innocence and curiosity. What is fascinating throughout the narrative are the ways in which each protagonist views things differently and the ways in which they display emotion and respect, allowing audiences to genuinely understand them and their motivations. As such, when the film ends, the tragic fallacies and the impact of events linger and resonate long, long after the final credits. Kim Go-eun gives the stand out performance within A Muse as high schooler Eun-gyo and is enthralling. The actress inhabits the role completely, conveying innocence, curiosity and vitality with genuine charisma forcing audiences to adore her as much as the protagonists do. Kim Go-eun’s charismatic performance is such that it is easy to forget her age and occupation, drawing spectators in with her enthusiasm and smile whilst also sympathizing with her as the unwitting catalyst in a love triangle. Passionate scenes are also sincere, and while the constant fetishization of her body occasionally undermines her character Kim Go-eun utilizes her physicality to convey a range of emotions depending on who she is with. 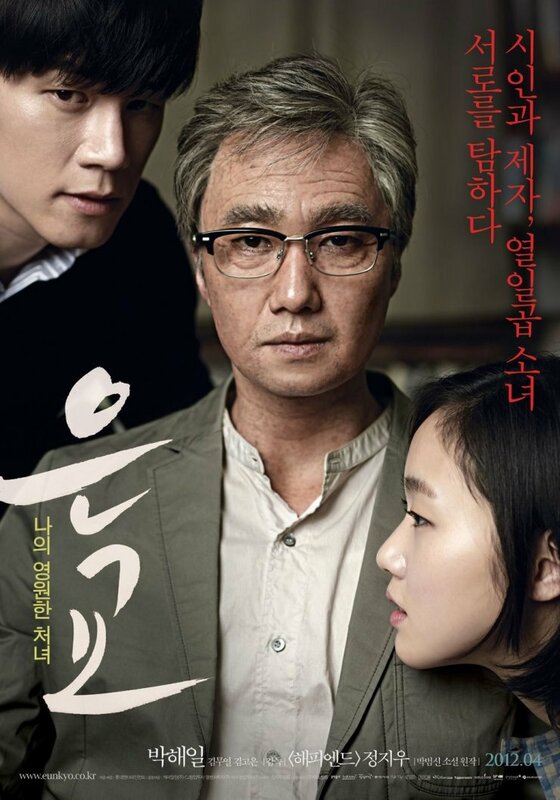 As always Park Hae-il gives a highly competent performance as elderly poet Jeok-yo. His casting is odd but understandable given the sexual scenes and fetishization of his love interest’s body, but it is difficult not to think that an older actor would have lent more credibility to the role. There are certainly a lot of actors of this age group in Korea that are incredibly talented, as Lee Chang-dong’s sublime Poetry, and Choo Chang-min’s Late Blossom, highlighted. In any case, Park Hae-il portrays the stoicism and loneliness of Jeok-yo well, conveying the evolution of the character subtly and organically. However there are several occasions where the actor is clearly trying to act like a senior citizen to the detriment of the scene, distractions in an otherwise competent display. Kim Moo-yeol, despite receiving the least amount of screen time, portrays the role of jealous young author Ji-woo competently. The driven and arrogant nature of the character is performed well, as is his complete lack of understanding in regards to the depth of both Jeok-yo and Eun-gyo. Ji-woo’s love/hate relationship with them both is also interesting to watch unfold and is never contrived, resulting in a slow build of tension just waiting to erupt. A film of great depth and symbolism, A Muse is an eloquent exploration of the nature of age, love, and relationships. While the fetishization of Eun-gyo’s body tends to undermine the spiritual connection between her and Jeok-yo, with Park Hae-il’s casting simultaneously helping to alleviate the sexualization as well as being an oddity, the film succeeds on the strengths of a wonderfully character driven narrative and a superb debut by actress Kim Go-eun. With the subtle, organic and romantic performances and directorial style, the themes explored within A Muse will undoubtedly resonate with audiences long after the finale. The corruption of the ruling elite is certainly nothing new in Korean cinema. After years of military dictatorships and scandalous corporate backhanders, it’s clearly understandable why such themes are continuously prevalent. However these narratives often approach from a reactionary perspective, highlighting the suffering of those victimized by injustices. Little explored are the foundations of a community, the roles and interplay of law, religion, power, crime and punishment in the creation of a society. Such Shakespearean motifs are traditionally reserved for period dramas, yet Kang Woo-seok’s (강우석) Moss (이끼) wonderfully examines the labyrinthine networks of power in a contemporary village in Gangwon province. Based on the incredibly popular internet comic, Moss is an exhilarating and fresh addition to the thriller genre. While struggling against a law suit, Ryoo Hae-gook (Park Hae-il (박해일) receives news that his estranged father, Yoo Mok-hyeong (Heo Joon-ho (허준호), has died. Visiting the estate, Hae-gook is surprised to learn of his late father’s role as one of the elder statesmen of the village, yet merely wishes to resolve any outstanding affairs and return to his life in Seoul. However Hae-gook’s curiosity is piqued when his father’s partner, the powerful village foreman Cheon Yong-deok (Jeong Jae-yeong (정재영) and his three right-hand men – Kim Deok-cheon (Yoo Hae-jin (유해진), Jeon Seok-man (Kim Sang-ho (김상호), and Ha Seong-gyoo (Kim Joon-bae (김준배) – continually attempt to persuade him to leave. As Hae-gook digs deeper into the mystery of his father’s death and the strange behaviour of the residents, he must confront the disturbing truth about the village and its inhabitants. Screenwriter Jeong Ji-woo (정지우) has translated the web-comic to film with incredible skill, lacing each protagonist with depth and nuance – as well as fully realised character arcs – that makes each confrontation compelling viewing. This is remarkable as the 163 minute running time may seem excessive, but the narrative is so fueled with suspense and the protagonists so fascinating that the time is hardly noticeable. The plot is the epitome of labyrinthine, carefully taking time to construct the scenario through flashbacks and the creation (and breakdown) of relationships through subtle character defining events. Director Kang Woo-seok is impressive in visualizing such dense material, from the intimidating fortress overlooking the village to the claustrophobic subterranean tunnels. Praise should also be bestowed upon the set design, lighting and editing departments, who display ingenuity in creating the tension-filled world of Moss. The actors are also wonderful in bringing the community of Moss alive. Park Hae-il is excellent as the idealistic Hae-gook who is continually involved in events beyond his understanding, while his nemeses – Yoo Hae-jin, Kim Sang-ho and Kim Joon-bae – are incredibly unnerving and intense in portraying the criminal classes/extensions of power. However, the most exceptional performance belongs to Jeong Jae-yeong, who is loud, violent and ambitious as a young man, but silently commands respect as an elder. The sheer intensity conveyed through his expressions is amazingly sinister, demanding obedience with merely a glance. The weakest link is Yoo Seon as store owner Lee Yeong-ji through no fault on her part, as her role is virtually forgotten until the third act when her presence is suddenly elevated into a lead protagonist. Thematically, Moss is also a triumph. The portrayal of corruption seemingly endemic with the ruling elite is hardly original, but Moss strives to explore all areas in the creation of a society, notably the role of religion. As such, the village in Moss acts as a microcosm for society, and how the younger generation must fight against the greed of their elders. Yong-deok, the village foreman, was a corrupt police officer in his youth but his ambition for power was continually unfulfilled. That is, until he met Mok-hyeong, a man with a violent past that had apparently found redemption through religion who was quickly amassing followers. The jealousy for power and influence ultimately fuels their relationship, yet both are keenly aware that alone they can achieve little. In joining forces to create a community both men have similar intentions but are ideologically opposed, as they wish to exert dominance over others but through different means. Each man is clearly representative of the ideological vie for power in society, and the process in which they become increasingly more corrupt is as organic as it is alarming. There is rather blatant bias however, as Mok-hyeong’s Christian ideology is constantly represented as inherently ‘good’ which diminishes the exploration somewhat. In discovering the sinister origins of the village, Hae-gook is representative of the younger generation that must reveal and persecute such greed. Hae-gook studies old books and documents, finds subterranean tunnels, and must even join forces with an enemy in the pursuit of his father’s murderer. As a young divorcee, Hae-gook embodies the change in society as the shift away from tradition becomes ever more apparent. His naivety and idealism is endearing but simultaneously foolhardy, as he continually fails to understand the larger events at hand. Moss is a incredibly well executed thriller that delves into Shakespearean themes of the vie for power amongst the ruling classes. The interplay of different features of society, from religion to the criminal classes, constructs a dense tale of suspense that highlights the unfairness, and the generational differences, within a culture and emphasizes the importance of prosecuting the corrupt. The bias nature in representing Christianity, and the under-developed female role slightly detract from the viewing experience, but despite this Moss is a highly entertaining and compelling foray into corruption in contemporary Korea.